Applications are invited online from qualified candidates through the proforma application to be made available on commissions website for the Notification pertaining to the various posts in the following departments in the state of Telangana. The candidates are advised to visit the commissions website for detailed information. The submission of online application is from 16-11-2017 and last date for submission of application is 11-12-2017. Final Keys for Physiotherapist, Radiographer, Paramedical Opthalmic Officer, Refractionist, Health Supervisor & Lab Technician Grade-II, vide Commission Notfn Nos. 58/2017, 59/2017, 60/2017, 61/2017, 62/2017 & 67/2017 (CBRT held on 10th & 11th May 2018). Physiotherapist, Radiographer, Paramedical Opthalmic Officer, Refractionist, Health Supervisor & Lab Technician Grade-II, vide Commission’s Notfn Nos. 58/2017, 59/2017, 60/2017, 61/2017, 62/2017 & 67/2017: TSPSC has conducted Written Examination for the above notifications on 10/05/2018 & 11/05/2018. The Final Keys of these exams will be available on TSPSC website from 06/07/2018. No further objections will be entertained on Final keys. HALL TICKETS: (TSPSC Refractionists Recruitment Hall tickets 2018) Hall tickets can be downloaded 7 days before commencement of Examination. Notification Number - Name of the Post -No. of VacanciesDepartments in the state of Telangana. i) Must have passed Intermediate examination with science subject. Age limit: Candidates age limit should have between from 18 to 44 years. Maximum Age (44years): A candidate should not be born before 02/07/1973. The Telangana State Public Service Commission (TSPSC) has issued notification for recruitment of 1261 various posts in Health Medical & Family Welfare Department, Insurance Medical Service and Telangana Social Welfare Residential Degree Colleges (TSWRDC) Women. Of the total posts, 1196 are of staff nurse in Directorate of Public Health and Family Welfare (DPH&FW), Telangana Vaidya Vidhana Parishad (TVVP), 35 radiographers in DPH&FW, 21 Health Supervisors in TSWRDC (Women), six physiotherapists in TVVP, two Paramedical Opthalmic Officers in DPH&FW and one refractionist in Insurance Medical Service. 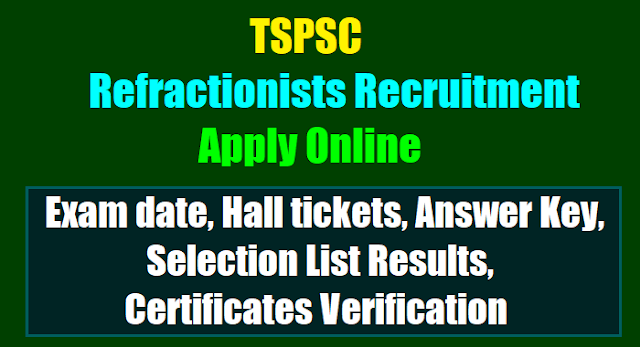 The TSPSC in a release on 08-11-2017 advised candidates to visit its website www.tspsc.gov.in for detailed information. Submission of online application will begin from November 16 and last date to apply is 11-12-2017. The Examination is likely to be held in the month of January 2018. The Commission reserves the right to conduct the Examination either COMPUTER BASED RECRUITMENT TEST (CBRT) or OFFLINE OMR based Examination of objective type.